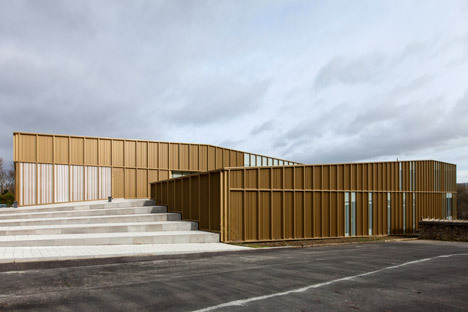 Strips of golden aluminium cover this carrying out arts school and library created by Ateliers O-S Architectes to stretch across a hillside in a Parisian suburb . 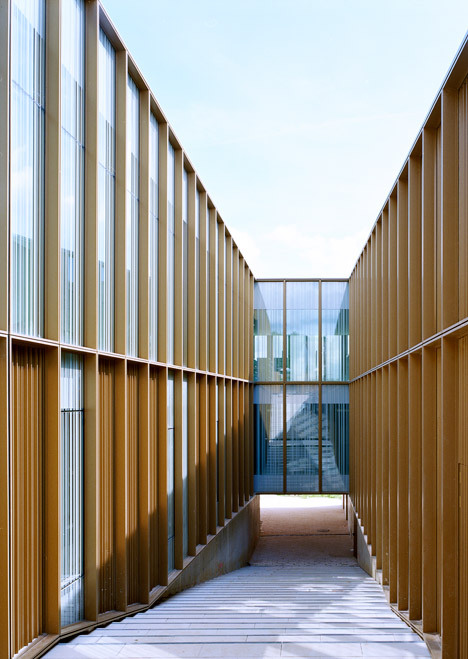 Ateliers O-S Architectes was commissioned to style the Cultural Center, Media Library and Music and Dance School for a narrow, graduated plot in Saint Germain lès Arpajon, a suburb just south of the city. It replaces an existing public library and a college of music and dance, both said to be no longer match for objective. 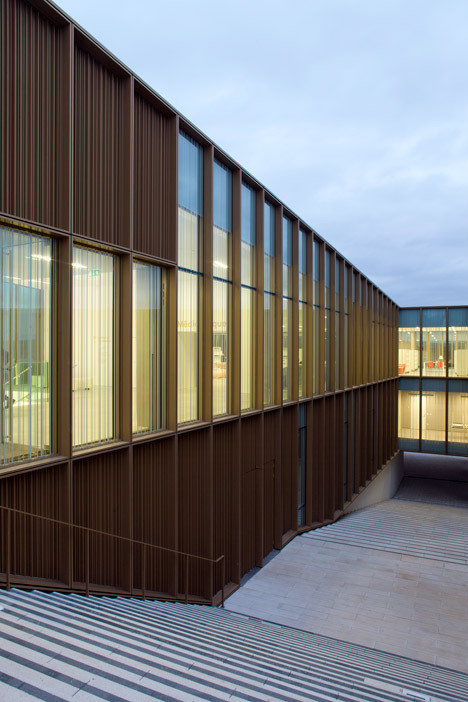 One branch of the building’s U-shaped program sits on the uppermost component of the site, while the other rests in a dip. 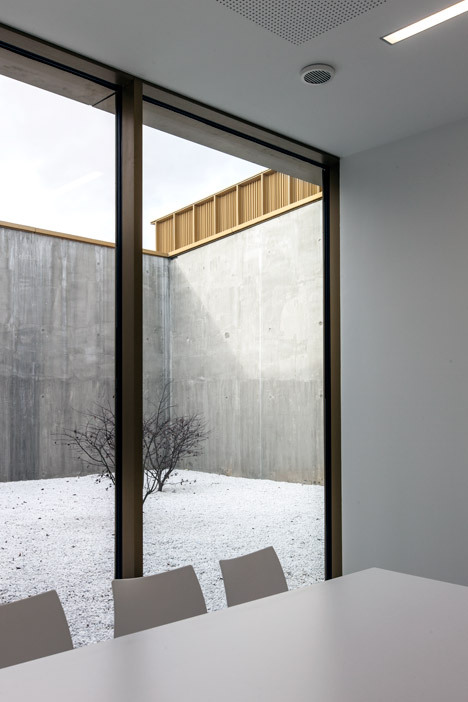 A glazed construction connects these two prolonged volumes, overhanging a stepped path that cuts through the centre of the complex. A set of broad methods kind the major approach to the constructing. This route also descends into the crevice below the U-bend, arriving at a patio that can be used for outdoor readings and music lessons. 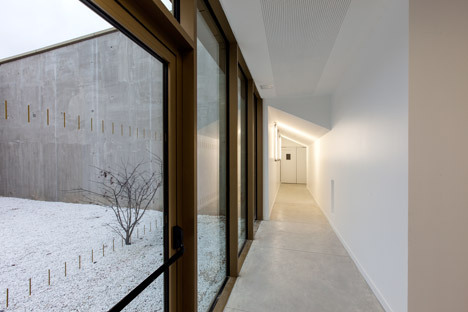 “The public entrance of the cultural centre opens between the two branches of the tools, as a welcoming hand to guidebook you by means of the building,” said the style group. The site is bracketed by a local substantial school and a cemetery. 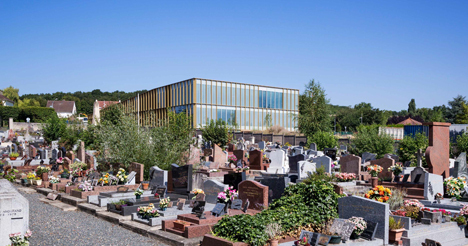 A patch of landscaping creates a buffer between the elevated part of the building and the graveyard, while a new entry street separates the structure from the school. 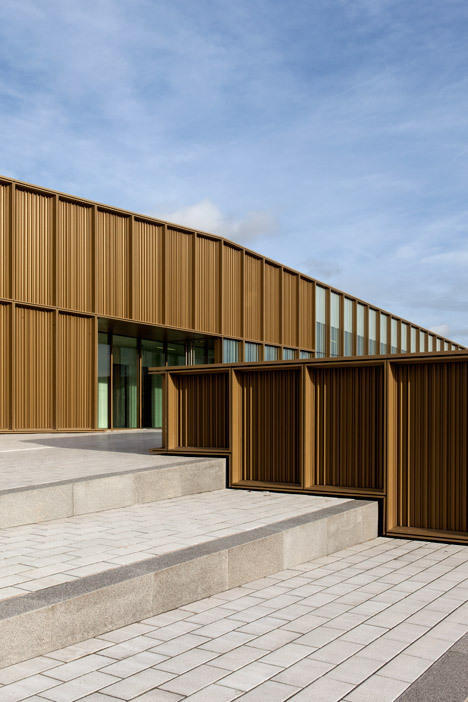 The external walls are covered in golden-brown aluminium grills. 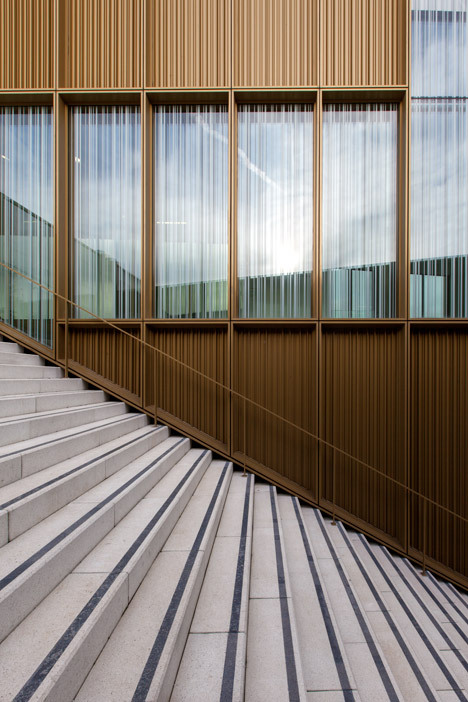 The vertical strips of metal develop various amounts of opacity and transparency for the spaces inside, as properly as hiding the building’s mechanical companies. The media library occupies an L-shaped space on the upper floor of the centre. The open-program studying room features colourful furnishings, although books are stored in boxy white containers. 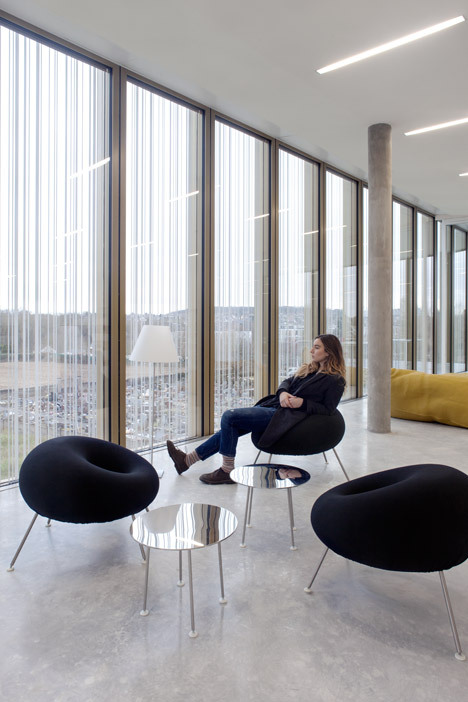 Mustard-coloured beanbags are dotted about the periphery of the area, allowing visitors to take advantage of views by means of huge windows dealing with a valley. 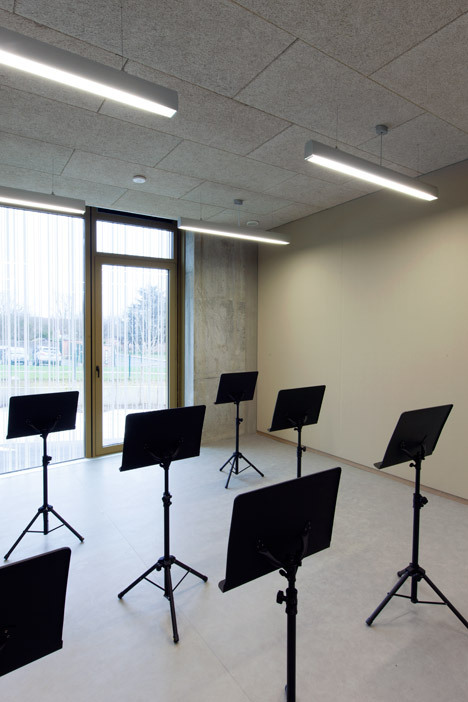 An auditorium, utilized by dance and music college students, sits at one end of the room over the lobby. 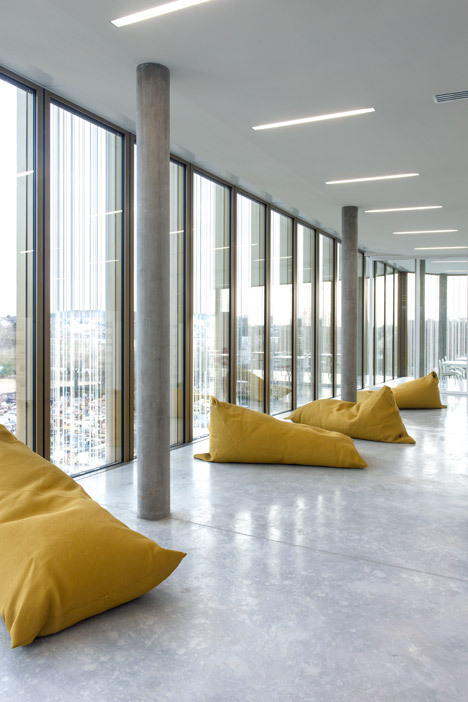 The dance and music college occupies the ground floor of the elevated volume, even though reduce wing homes the school’s administration offices. 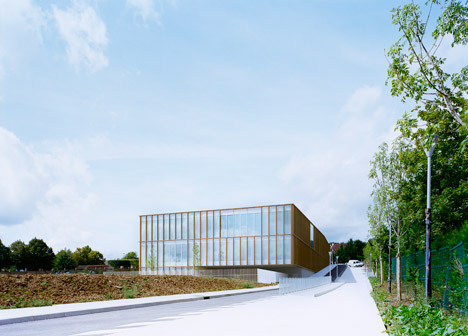 Dance studios are contained within the glazed bridge between the two components. Planting covers the roof, meant to protect views over the landscape from surrounding buildings. Photography is by Vincent Ferrane, except if otherwise stated.